This week, smash singer and songwriter Ed Sheeran, known for his acoustic pop, folk, beat-boxing and witty lyricism, is set to perform two sold-out shows with international hits including tracks off his recent album X, named one of Billboard’s Top 10 Albums of 2014. 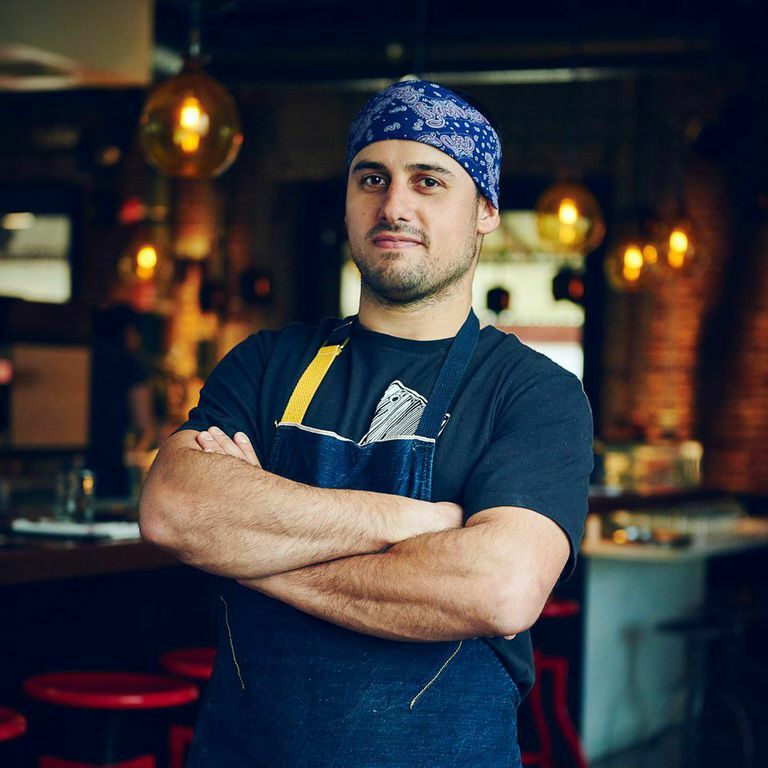 Like Sheeran, owner and chef, Ori Menashe, of Bestia knows a thing or two about making a mark. Honored as one of Food & Wine magazine’s 2015 Best New Chefs, he’s a superstar of L.A.’s thriving culinary scene, drawing crowds to his Italian–inspired restaurant for his popular roasted bone marrow, chicken liver crostini and house-cured meats. In a pan with water, cook the beets with salt and pepper, thyme, and smashed garlic. Cover the steaming pan at 375 degrees. Check on them in 30 minutes and/or until the beets are fork tender. Add all ingredients, minus the olive oil, into a mixing bowl. Slowly drizzle the olive oil into the ingredients while stirring. Add Belgian endives, beets, chives, ¾ of the walnuts, salt and pepper. Toss with mustard vinaigrette. Prepare in individual bowls. Using a peeler, peel the cheese and divide on salads. Sprinkle the remaining walnuts on the top of each salad. 1 carrot, chopped into ½ inch pieces. 1 small yellow onion, chopped into ½ inch pieces. 1 celery rib, chopped into ½ inch pieces. Add the carrot, onion and celery, season with salt and pepper and cook over moderately low heat, stirring, until the vegetables are very tender and caramelized, 20 minutes. Add the anchovies and tomato paste and cook, stirring, until the anchovies dissolve and the tomato paste is deep red, 5 minutes. Add the beet greens, season with salt and pepper, and cook, tossing occasionally, until wilted, 7 minutes. In a bowl, soak the bread in the milk until the milk is absorbed, about 5 minutes. In a large bowl, combine the beef, ricotta, parmigiano, egg, lemon zest, crushed red pepper, parsley, fennel, kosher salt and black pepper. Squeeze any excess milk from the bread and add the bread to the bowl. Mix the meat mixture well, then roll it into sixteen 1 1/2-inch balls; transfer to a baking sheet. In a cast-iron skillet, heat 2 tablespoons of the canola oil. Cook half of the meatballs over moderate heat, turning, until golden brown and no longer pink within, about 15 minutes. Repeat with the remaining 2 tablespoons of canola oil and meatballs. with Parmigiano, chopped oregano and sea salt. Assemble four meatballs in each sandwich with greens and provolone cheese. Recipe courtesy of Co-Owner and Pastry Chef Genevieve Gergis. Melt chocolate and butter in a pot. Whisk in sugar and eggs, one at a time. Add vanilla extract and flour into pot. Whisk until shiny and the batter pulls away from the sides of the pot. Mix walnuts and salt into pot. Pour batter onto a buttered pan (8×8). Bake at 350 degrees for 18-20 minutes, or until crust forms on the sides of the pan. The smash singer/songwriter takes it all – acoustic pop, folk, beat-boxing and witty lyricism – and spins out huge, international hits, including his recent album X, named one of Billboard’s Top 10 Albums of 2014. The beloved film in its 50th anniversary year, interactive fun-packs, costumes and thousands of fans, all make this one of the most enjoyable nights of the summer. Grammy®-winning dance music icons Basement Jaxx return to the Bowl on the heels of their new album Junto (“together”). Celebrating a 20-year career of mind-bending pop-house, R&B, ragga, deep funk & ambient techno, Simon Ratcliffe and Felix Buxton reign as the masters of the club mix. Notoriously funky Bootsy Collins is one of the all-time greats, laying down the low end for P-Funk, James Brown, his own Rubber Band and cosmic solo projects.